If you have a toddler that loves to sing and dance then make your way to Mr Biscuits in Market Walk, Newton Abbot this July. Mr Biscuits is very generously sponsoring every toddler in Teignbridge to have a FREE music and movement class with JJ’s Arts Academy. 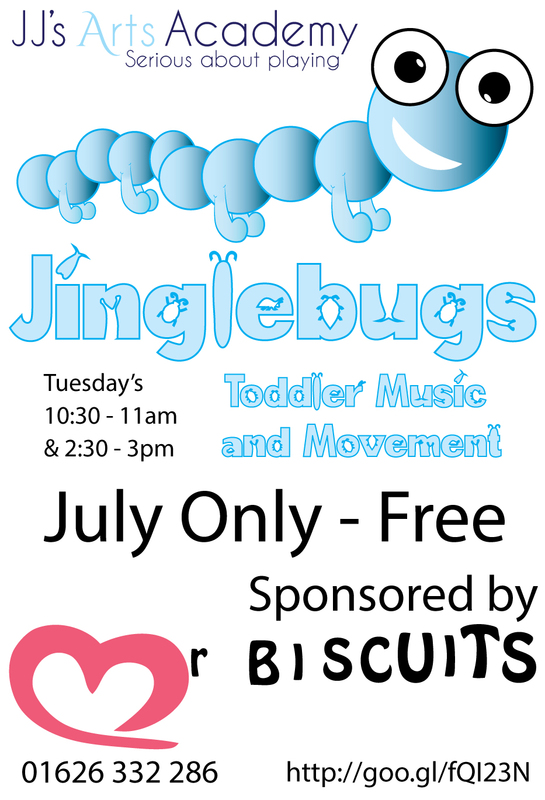 Every Tuesday in July Mr Biscuits will be hosting Jinglebugs, a toddler music and movement session completely free of charge. There will be two free sessions each Tuesday in July, the first starting at 10.30am and the second at 2.30pm. Jinglebugs lasts for 30 minutes and is a fun and stimulating session for toddlers and parents to enjoy together. Combining music, movement, singing and play to encourage social and cognitive development. After working up a thirst singing and dancing at Jinglebugs, why not stay for a drink and one of Mr Biscuits famous brownies? Mr Biscuits and the staff at JJ’s Arts Academy look forward to meeting all the new Jinglebugs for the first FREE session on Tuesday 7th July. Previous Previous post: Bag It. Beat It.